The Groundlings Theatre is dynamic and an impressive Georgian Theatre built in 1785. Groundlings is steeped in history and was formally known as The Old Benny, the first free school in the city. It is located near Gunwharf Quays and The Historic Dockyard. 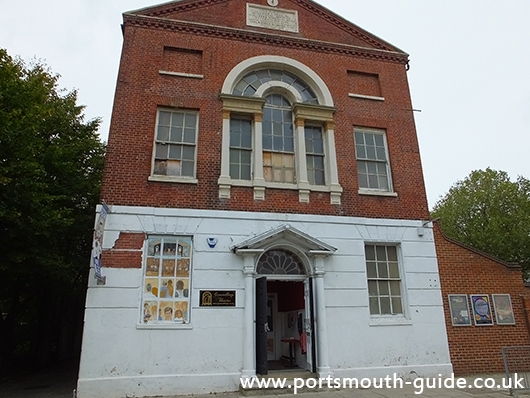 The Groundlings Theatre Company won the bid to buy The Old Beneficial School in Portsea and made the building its new home in April 2010. This stunning historic grade II star listed building is being brought back to life providing a wonderful focal point for the area. This classical building was built in 1784 by the Beneficial Society, as a public hall and charity school for poor boys. It was extended in 1836 to provide an education for girls as well. The school closed in 1960 when St Georges and Beneficial School was built alongside, making it redundant. The building now became a youth centre until a fire almost destroyed it in 2004. The grade Two Star Theatre has a versatile stage, which can be placed in the round or used for studio space. There is also a proscenium arch and the theatre has the flexibility of staging Dinner Theatre. With a vast wardrobe with over 10,000 costumes, props and set departments, costume hire is a must! The Theatre has its own in-house restaurant, two bars and a car park Within this unique theatre, we have a resident casting director and agent, we can also offer a casting suite if required. The theatre is often used for filming by various production companies. The BBC film commemorating the centenary of The Titanic: Titanic Southampton Remembers, was recently featured. Actors from the drama school were also used. Events including plays, productions and Murder Mystery evenings run throughout the year. The theatre is also available for weddings and corporate event hire. At Groundlings there is a great range of drama classes from Youth Drama to Adult Dram courses. For details about their shows and classes please have a look at their website.